This essay is based on an interview conducted by Yehudit Spero, a granddaughter of Rabbi Israel Porath, with her father-in-law Rabbi Shubert Spero in Jerusalem, Israel. Rabbi Spero was born in New York City and earned a PhD at Case Western Reserve University. He was the rabbi of Congregation Young Israel of Cleveland from 1950 until 1983, when he and his family made aliyah. He served many years on the Orthodox Rabbinic Council when it was led by Rabbi Israel Porath, the spiritual leader of the Heights Jewish Center. In Cleveland in 1950 the only rabbinic organization was the Orthodox Rabbinical Council (Merkaz Harabanim). At the time the O.R.C. as such had no special role either in the Orthodox or general Jewish community except perhaps when one of the rabbis would, in the performance of his rabbinic duties, need a bet din. By the early 1950's with the gradual influx of the younger American-born rabbis: Louis Engelberg (who had served as a chaplain in the U.S. army and had been in Cleveland since the end of W.W. II), Jacob Muskin, Shubert Spero, Israel Pickholtz and somewhat later Melvin Granatstein and Marvin Speigelman, a more assertive spirit began to prevail in the O.R.C. As these younger men began to make their presence felt in the general community and brought a certain dynamism to their congregations, a new respect now was born for an Orthodoxy that spoke in a modern united voice. Over the years there followed a number of significant gains for the Orthodox Jewish community. In 1950, the most notable and senior member of the O.R.C. was Rabbi Israel Porath (1886-1974) who had been in Cleveland since 1925. Born in Jerusalem in an Ashkenazi family who had been there two generations, he was educated at the Etz Chaim Yeshiva there. Personable and energetic, a rabbinical scholar with a practical bent and sense of humor. Rabbi Porath was always able to work by consensus and persuasion at every stage of the development of the O.R.C., no matter what type of rabbis he was presiding over at the time. He never asserted the authority of his superior Talmudic knowledge or accepted the position of Nasi but always insisted on having a Presidium as titular heads of the Council. There never was any rivalry or jockeying for honors or publicity. Rabbi Porath conducted all meetings with dispatch, suffering no empty talk or lengthy diatribes. 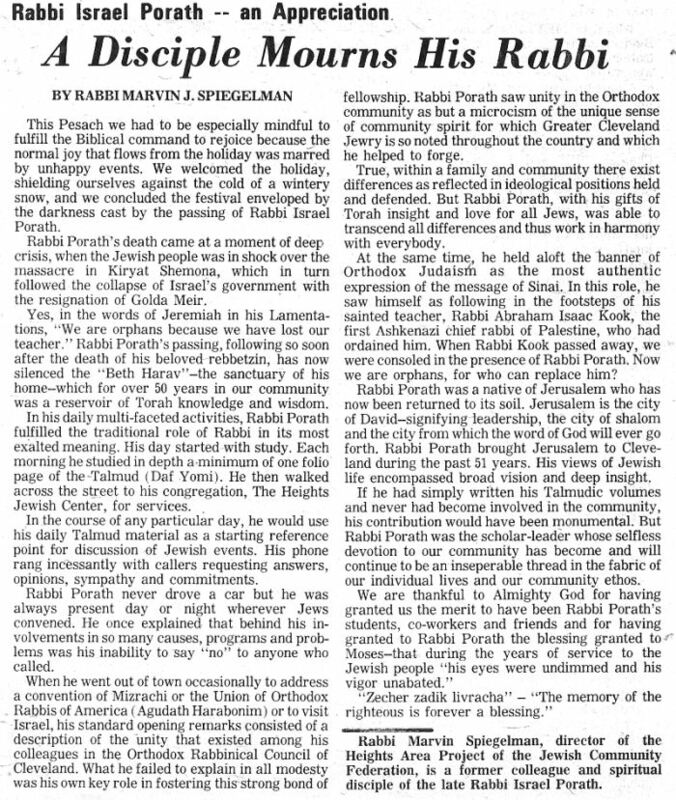 Even before 1950, Rabbi Porath was highly respected by officials of Cleveland's Jewish Community Federation, by his Reform and Conservative rabbinic colleagues, and by city and state officials for himself and his attainments, for his personality and his scholarship. However, by the 1960's Rabbi Porath would be introduced as the dean, the zkan Harabanim, the dayen, the senior scholar of the rabbis, realizing that he represented the united voice of the many spiritual leaders of the Orthodox community, including those of the Telz Yeshiva and the Chassidic community.